Beer and wine lovers, Kyle Westfall wants to turn you into crafters. 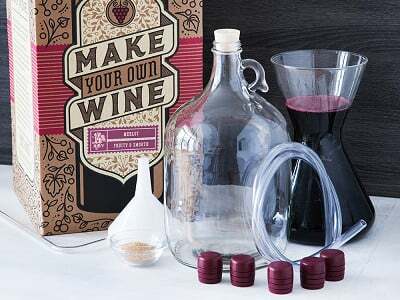 His DIY kits contain just about everything you need to make outstanding craft beer or wine in the comfort of your own kitchen. After trying many home brewing kits, Kyle wanted to raise the bar. His goal was to create a kit that gave results like professional craft brewers at an accessible price. After two years of home brewing, followed by months of recipe testing and refining, Craft a Brew was born. From there, it was an obvious extension to help wine enthusiasts make their own vintages, too. Designed to let you make the best possible beer right out of the box, the premium brewing kits use only 100% malt extract, world-class specialty grains, fresh hops, and high-quality yeast. All of the tools are included, too (except empty bottles), so you can get to crafting right away. The wine kits are based on the same philosophy—great ingredients, reliable equipment, and ease of use. Whether you opt for a brew or vino kit (or both), in a short time you'll be enjoying the fruits of your labor. 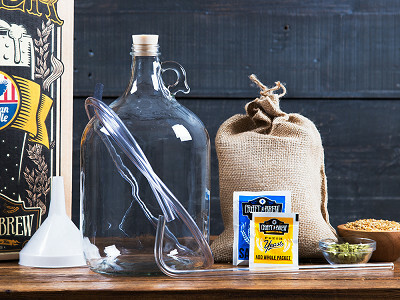 Recipes for the at-home beer brewer. 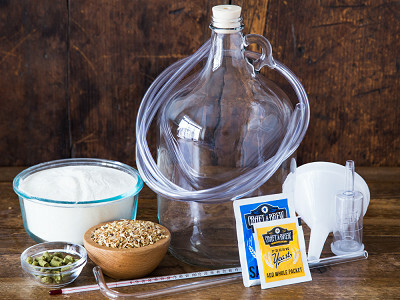 Includes everything you need to bottle your batch of home brewed beer. Thermometer to read fermenting temperatures for the home brewer. Nylon hop straining bag for DIY beer brewing. Mini Auto Siphon for DIY brewers of beer. Hi Daily Grommet fans. I strived to create a brewing kit that will make outstanding craft beer right out of the box. It was designed to turn beer lovers into beer brewers and to have my customers make the best possible beer in their own kitchen on their first attempt. Brewing beer may seem like a difficult task but with our kits it is simple, fun and straightforward. I'm happy to be chosen by the Daily Grommet to share my passion with you. If you have any questions about our kits or brewing I'll be happy to answer them here. Okay - I love this idea. I looked at the website and video for a description of what the 'Recipe' is that is priced at $18 and didn't see it described anywhere. Is it more ingredients for a second batch of beer? I understand that the starter kit has everything for 10 - 12 bottles...I just don't know what the item labeled 'recipe' includes. Hoping it's the ingredients for more! If so, I'm ordering! * Chocolate Milk Stout Recipe Kit: Dark malt extract, brewers grains (chocolate malt, dark crystal malt), hops (cluster), yeast (Safale S-04 whitbread), raw cacao nibs, lactose, sanitizer and a brewing bag. * O. G. (Orange Golden) Recipe Kit: Golden light malt extract, brewers grains (Carapils), hops (Cascade), yeast (Safale S-05), sweet Belgian orange peel, sanitizer and a brewing bag. * Hefeweizen Recipe Kit: Malt extract, brewers grains, hops (Tettnang), yeast (Safbrew wb-06 dry yeast), sanitizer and brewing bag. 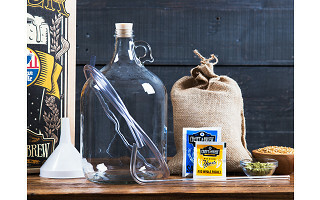 * Oak Aged IPA Recipe Kit: Malt extract, brewers grains, hops, American oak chips, yeast (Safale s-04), sanitizer, brewing bag and special instructions. @Tori where are your additional beer kits listed and all the ing. for each one comes with everything needed correct as far as ing. @ Terri: The info is in the DETAILS tab (under the video & photos) on the page where Craft the Brew is featured. @Marsha Thats right Tori, those are all of our available recipe kits and all of the equipment that is included in the starter kit can be used again and again. We will also be releasing new recipe kits every few months so once you invest in the brewing kit you will have ever expanding choices of what to brew next! - Chocolate Milk Stout: Moo-ve over light beers, this rich chocolate milk stout uses raw cacao nibs and lactose sugar to achieve a smooth, semi-sweet, roasty chocolate flavor. - The O.G. 'an orange golden ale': This Orange Golden ale is fresh with an infusion of sweet Belgian orange peel giving it a funky citrus flavor and aroma. Light on the hops yet big on taste this is one original brew that will leave you thirsty for more. - Smooth Brown Ale: This brown ale is mild and delicious with a smooth malty character that all beer lovers will enjoy. Lightly hopped with both Willamette and Fuggle hops; this is a perfect beginner brew for those who are starting to appreciate darker beers. - Hefeweizen: This traditional Hefe Weizen is unique and easy to drink. It has a silky smooth mouth feel with tastes of citrus, clove and banana. This Hefe Weizen is a great beer to be enjoyed year round! - American Pale Ale: A highly hopped, bitter pale ale with light malt flavors and a crisp taste. If you like Sierra Nevada Pale Ale you will love this brew! - Oak Aged IPA: A take back to the traditional India Pale Ale style that is highly hopped giving the beer a fresh, bitter bite. The beer shows hints of oak giving it that barrel aged taste, much like the original English Pale Ales that were sent to India in hand crafted toasted oak barrels during the 18th century. Hate to say this but I will be letting all my family and friends know not to buy from your company my dad ordered a kit for my husband and all the ingredients did not even come with it. Thanks for nothing!! @Marsha where do you see the cost of additonal beer kits? @ Terri: Under the Price Range (far right of the video), you'll see an OPTIONS box with a down arrow. Click the arrow and you'll see a list of the kits and other goodies offered along with the prices. My dad wasted his money purchasing this item for my husband all of the ingredients didn't even come with the kit. WHAT A RIP OFF!!!!!! and A WAIST OF YOUR TIME AND MONEY!!!!!!!!!!!!!!! WOULD NOT BUY 'Craft a Brew kit" I will be letting all my family and friends know NOT to purchase from this company. @ Tina: We're very sorry the ingredients were not in the kit. We suspect it was an error since Kyle's goal is to give you a DYI kit, with the ingredients you need, that allows you to use the same basic processes that professional craft brewers use. Our Customer Support Team will be in touch directly to get a new kit to your husband. @ Tina - do you not think you are being a little extreme? Give people a chance to make good on a mistake! Do you never make them. You really should think twice before you come on and scream about something that may have been an oversight. I have grown tired of having to wade though unhelpful and hysterical reviews such as yours. They always include spelling errors, NO punctuation and lots of exclamation points. I think people like you just like to get attention, to shout and I think it's a shame. Did you contact the company first? Did you call or email them? Hi Kyle! I am going to order one of these kits for my Dad for Christmas. I was going to get him the IPA kit, and then get the Pale Ale recipe. If I am reading and understanding everything correctly that means he will get one kit, but can make two batches of beer? I wanted him to be able to try out two different flavors. Do you think those are good choices? I know he likes IPA, but really he drinks a variety of beers. Also, I am confused on whether I really need to buy any of the added accessories. Can he make the beer simply without them, or is there one that you think he would REALLY need? Thanks so much for the great deal!